Hobo Mama Reviews: WINNER: Amy Adele + Labor Day sale ends today! A big congratulations to the winner of the Amy Adele $50 giveaway — #124! Her items are so darling. If you were not the lucky Julie, don't fret: There's a fabulous sale of 20% off orders of $20 or more, plus free shipping, that runs through TODAY, September 7. Use code 324FREE at checkout. 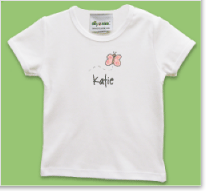 You can buy personalized t-shirts and onesies like Julie, flat cards, notecards, invitations, calling cards, labels, and more! Remember, too, that all stationery products are printed in high quality on 100% post-consumer recycled paper, so it's a green choice for your kids or yourself. The rest of the month, you can enjoy 25% off any sports-themed products till Sept. 30. And continue to check back at the AmyAdele.com sales page for future deals! Enter the WondaWedge giveaway for your own inflatable back support pillow, for indoor and outdoor use! Submit a post to the September Carnival of Natural Parenting on how your family learns at home.